The paper examines the process that led, throughout over 30 years of policy evolution, to the integration of culture in the International Development Agenda. 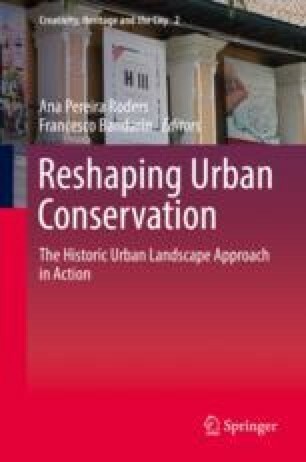 It also looks at how the Recommendation on the Historic Urban Landscape (HUL Recommendation) has reflected the new policy framework and has transferred it into the field of urban conservation. From the Decade for Cultural Development (1988–1997) to Agenda 2030 adopted by the United Nations in 2015, a major shift has occurred in cultural policies. During the 1990s and the 2000s, several important innovations have come about, ranging from the adoption of two new international conventions, for intangible heritage (2003) and the diversity of cultural expressions (2005). Parallel to this shift, the World Heritage Convention has evolved, with the inclusion of new heritage types such as cultural landscapes. Within this Convention a debate on the conservation of urban heritage has led to the Vienna Memorandum of 2005 and later to the adoption by UNESCO of the HUL Recommendation. This has prompted a broader reflection on the role of cities and urban heritage in cultural policies, currently under way. The adoption of the New Urban Agenda in 2016 has opened up new perspectives on urban heritage policies and on the role of culture in promoting urban regeneration and resilience. Australia ICOMOS. (2013). The Burra Charter. The Australia ICOMOS charter for places of cultural significance. http://portal.iphan.gov.br/uploads/ckfinder/arquivos/The-Burra-Charter-2013-Adopted-31_10_2013.pdf. Accessed 9 July 2018. ICOMOS General Assembly. (1987). Charter for the conservation of historic towns and urban areas (Washington Charter). Washington, DC: ICOMOS. https://www.icomos.org/charters/towns_e.pdf. Accessed 9 July 2018. UN. (2000). United Nations Millennium Declaration. New York: United Nations. http://www.un.org/millennium/declaration/ares552e.htm. Accessed 9 July 2018. UN. (2015b). Agenda 2030, goal 11.“Targets of sustainable development goal 11: make cities inclusive, safe, resilient and sustainable. http://www.un.org/ga/search/view_doc.asp?symbol=A/RES/70/1&Lang=E. Accessed 9 July 2018. UN. (2016). Habitat III: The United Nations Conference on Housing and Sustainable Urban Development. Quito, 17–20 October 2016. https://unhabitat.org/habitat-iii/. Accessed 9 July 2018. UNESCO. (1982). World conference on cultural policies. Mexico City, 26 July–6 August 1982. http://unesdoc.unesco.org/images/0005/000525/052505eo.pdf. Accessed 9 July 2018. UNESCO. (1990). World decade for cultural development 1988–1997 – Plan of Action, Paris, UNESCO (CC-89/WS-20). http://unesdoc.unesco.org/images/0008/000852/085291EB.pdf. Accessed 9 July 2018. UNESCO. (1998). World conference on cultural policies for development. Stockholm, March/April 1998. http://www.wwcd.org/policy/Stockholm.html. Accessed 9 July 2018. UNESCO. (2001). Universal Declaration on Cultural Diversity. Paris, UNESCO. http://unesdoc.unesco.org/images/0012/001271/127162e.pdf. Accessed 9 July 2018. UNESCO. (2016). Culture: Urban future. Global report on culture for sustainable urban development. Paris: UNESCO. http://unesdoc.unesco.org/images/0024/002459/245999e.pdf. Accessed 9 July 2018. UNESCO General Conference. (1976). Recommendation concerning the safeguarding and contemporary role of historic areas. Nairobi: UNESCO. http://portal.unesco.org/en/ev.php-URL_ID=13133&URL_DO=DO_TOPIC&URL_SECTION=201.html. Accessed 9 July 2018. UNESCO General Conference. (2005). Convention on the protection and promotion of the diversity of cultural expressions. October 2005. Paris: UNESCO. http://unesdoc.unesco.org/images/0014/001429/142919e.pdf. Accessed 9 July 2018. UNESCO World Heritage Centre. (1995). The Nara Conference on Authenticity, Nara, Japan, 1–6 November 1994. Paris: UNESCO World Heritage Centre. https://whc.unesco.org/document/116018. Accessed 9 July 2018. World Bank. (2000). Culture counts: Financing, resources, and the economics of culture in sustainable development. Proceedings of the Conference held in Florence, Italy (October 4–7, 1999). Washington, DC: World Bank. http://documents.worldbank.org/curated/en/302131468739317900/pdf/multi-page.pdf. Accessed 9 July 2018. World Commission on Culture and Development. (1996). Our creative diversity. Paris, UNESCO. http://unesdoc.unesco.org/images/0010/001055/105586e.pdf. Accessed 9 July 2018. World Heritage Centre. (2017). Operational guidelines of the World Heritage Convention. UNESCO. https://whc.unesco.org/document/163852. Accessed 9 July 2018.